Faced with declining candidate quality for teaching posts, we need to consider the variability of initial teacher training (ITT) and how it might be adding to our recruitment woes. The most recent Teacher Recruitment Index from the Times Educational Supplement reports that headteachers are unhappy about the deterioration of the quality of candidates applying for teaching posts. In the face of a teacher recruitment crisis, this is a serious concern. If the size of the pool and the fish are diminishing, there is certainly cause for alarm. However, at the risk of being controversial – and basing my argument on a lot flimsier foundation than the TES – I rather suspect that the common factor in lowering the quality of teacher candidates might actually be the variability in the quality of their training. School-based teacher training and I go back a long way. As a headteacher running a training school (that would now be a teaching school) I was responsible for training the very first graduate teacher in my authority. In that initial phase it took me ages to write the training plan, interspersed with phone calls to the Teacher Training Agency who would say, ‘well, we’re new to this as well’. The only moderating feature between providers (or, recommending bodies as we were styled) was the TTA assessor. Unsurprisingly, the DfES found too much variability between schools and the GTP moved to ‘accredited recommending bodies’. I worked for these as a tutor for many years and, since coming out of headship, work for about a third of my time for the same provider as part of the decision-making team. Now, of course, we are working as the provider to schools delivering the School Direct programme in a return to a fragmented model, although we also have our own trainees as a SCITT in our own right. We’re quite a big provider, responsible for a couple of hundred trainees each year. From this viewpoint, it is evident that, rather than a lower quality of trainee entering the profession, the baseline seems to have shifted upwards – at least academically. We are seeing more trainees with very good degrees, sometimes a Masters and occasionally a PhD. Two of our Science trainees this year are medical doctors. So, why the concern about the quality of candidates? If it isn’t their academics, it must be something other. Perhaps, like the early GTP, there is too much variability between schools, as their own providers. This is sometimes a difficult message for schools to hear, especially when they think they train their teachers well. When a colleague and I carried out a ‘mocksted’ for school-based provider with several trainees across their trust, we were surprised at some aspects of their practice. They thought they were outstanding. We thought they required improvement. After taking our advice, they were judged to be good. But, I hear you cry, we’re all working to the same Teachers’ Standards – where the variability? In fact, much of the variability lies not in the application of the Teachers’ Standards, but in the application of the ITT Criteria. Criterion 2.1a requires that training programmes enable trainee teachers to meet all the standards for QTS across the age range of training. The experienced provider with which I work translates this literally. We say that a trainee must experience the full age range by teaching substantially in each year group. Thus a KS2 trainee must teach each of Years 3 to 6, a trainee teaching in KS3/4 must teach each of Years 7 to 11. However, some schools interpret this much less generously and the trainee does not get the full breadth of experience. This is especially true if School Direct is a source of cheap labour and the trainee is allocated a class. I know, from experience, that really successful schools where trainees are covering a vacancy still enable them to teach across the full age range. Does this matter? I recall a trainee working in Year 5/6. She was an exceptional teacher in all respects. Until she went to Year 3, where she was a complete disaster. It was all fixable and she emerged as the gifted teacher she is, able to teach across the full age range, but she needed the full experience of training. This is deliverable, especially if combined with the expectation of substantial teaching in each year. But some schools want their trainee to teach in three age ranges, with one being a ‘minority key stage’. Thus a KS2 teacher does a placement in KS1; a KS3/4 teacher does one in KS5. So, as well as frequently not providing full coverage with the training age range, these providers are providing a weak second placement outside the teacher’s specialism – with the expectation that they gather evidence across what is effectively three age ranges, not two. This dilutes the quality of training. Criterion 2.4 requires that each trainee teacher has taught in at least two schools. Clearly, if that second school is outside the key age range, there is already a problem but the scope of the criterion says that they must have taught in as well as experienced the second school and that they should have had enough relevant experience. For some schools, ‘enough’ is regarded as three weeks. This is not enough time for a trainee to have substantial teaching experience. A trainee needs six weeks, at least. Ideally this can be in a block but it’s equally valid to have three two-week placements. Since trainees need to plan and deliver sequences of lessons, it is neither acceptable to release them for one day a week, although this could supplement a shorter block practice. So, this is about the quality of the training experience, far more than the quality of the trainees, as the research might suggest. Schools need to stop regarding School Direct as a recruitment solution to put faces in front of classes. They need rather to look to the quality of the training experience received by their trainees and how this helps to create a generation of skilled and effective teachers. 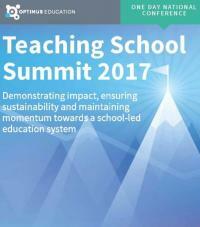 We're delighted to announce our upcoming Teaching Schools Summit, set to take place on Thursday 27th April 2017 in London. This event will give you everything you need to improve ITT across your alliance and move towards a school-led approach to teacher training. Are schools facing a recruitment crisis?